Don’t just think of ham as a holiday meal! Stock up when they are on sale, and store them in your freezer. Keep reading for some tips on how to thaw a ham. Most hams that you buy at the grocery store are in not frozen. They are refrigerated, and ready to cook. (Or are fully-cooked and ready to heat up, depending on the type of ham. But hams freeze really well! Around here, we mainly think of ham as a holiday dish, which means that we eat a lot of it in November and December, and again at Easter. But you can buy a ham or two to freeze when they are on sale, and have a ham any time you want! The only trick is to be sure you’re thawing the ham safely. Hams are like turkeys – they are big pieces of meat, and they can take a lot of time to thaw. Your average ham is around 9-12 pounds, so they do take up less room in your refrigerator than a 12-18 pound turkey. But you do still need to plan ahead to get the ham thawed in time to cook it. There are three safe ways to thaw ham. This is the safest way to thaw ham, but it takes the longest. The temperature in your refrigerator (between 34-38 degrees F, or 1-3 degrees C) is warm enough to let your ham thaw, but still cold enough that any bacteria on your ham won’t wake up to have a party just yet. The ham should be on the lowest shelf of the refrigerator. Place it inside a pan with a lip to catch any drips that might happen during thawing. (A baking sheet like this one works well. Or if your ham will fit in a smaller pan, try a 9×13 baking pan.) Keeping your ham inside a container and on the lowest shelf of the refrigerator will minimize the chance of any cross-contamination of other foods in your refrigerator. 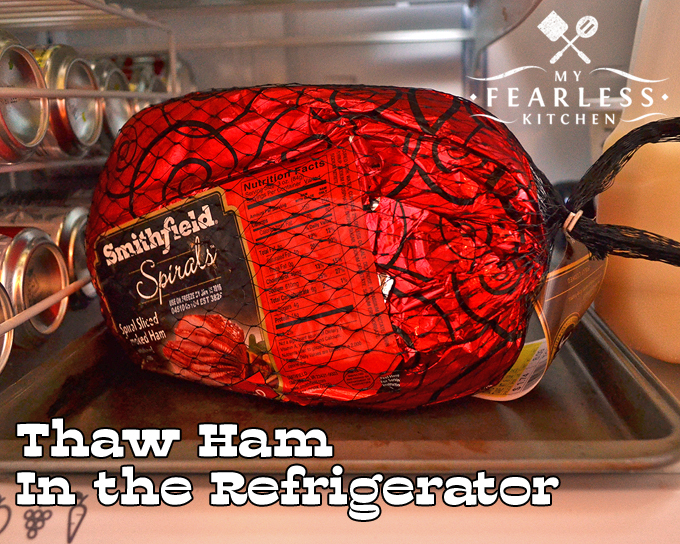 If you don’t have space inside your refrigerator, you can thaw your ham inside a cooler! 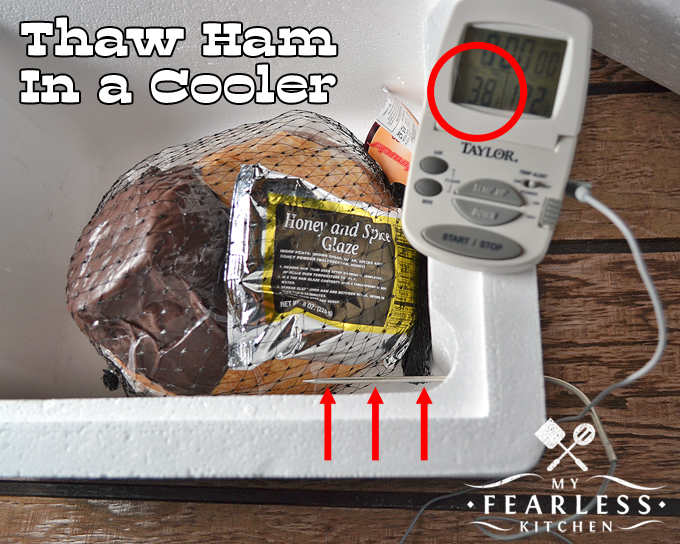 Place the ham in a cooler, and set the cooler somewhere out of the way (ideally somewhere that is a little cool). Monitor the temperature inside the cooler; if it starts to rise to 40 degrees F or above, add ice packs to keep the temperature between 35-40 degrees F (1-4 degrees C). I like these drink coolers (it’s how I thaw our turkeys). Styrofoam coolers work well too. You can pop the end of a probe thermometer right through the side of the cooler to monitor the temperature. Then set the alarm to alert you if the temperature reaches 40 degrees F, so you know to add some ice packs! Ham thawed in the refrigerator can stay refrigerated for 3-5 days before cooking. It can be refrozen if you decide not to cook it within that time. If you forgot to take your ham out of the freezer in time, you can also thaw it in cold water. The water does have to be cold. If you use warm or hot water, the temperature of the outside of the ham will reach 40 degrees F (4 degrees C) and above well before the inside of the ham is thawed. Temperatures above 40 degrees F (4 degrees C) encourage bacterial growth, and could set your family up for food poisoning. To thaw a ham in cold water, make sure that the ham is securely wrapped in an air-tight bag. If the meat is exposed to the thawing water, it could absorb some of that water. This will change the taste and texture of your ham. Any bacteria present in the water or the kitchen could also contaminate the ham. Once your ham is securely wrapped, plug the sink, place the ham inside the sink, and fill the sink with cold water. Drain the sink and change the water every 30 minutes. Ham should be cooked immediately after thawing in cold water. Ham thawed in cold water should not be refrozen. In a pinch, you could also thaw a ham in a microwave. 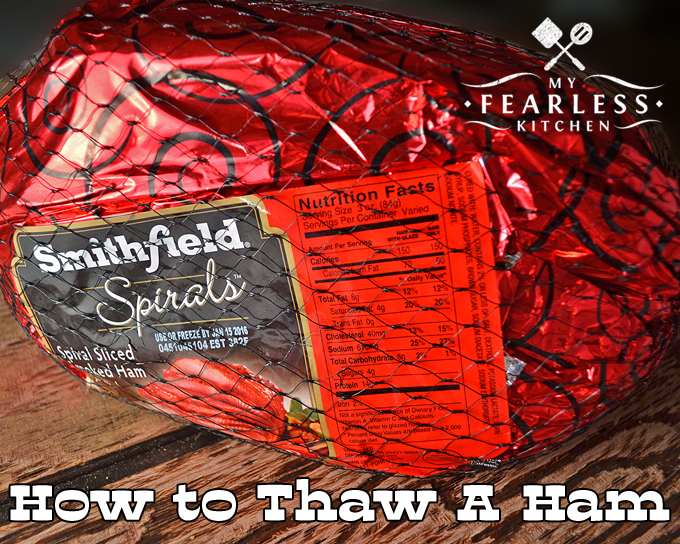 This method is not typically recommended, especially for larger pieces of meat like hams, turkeys, and roasts. The outside of the meat will start to cook before the inside is thawed, giving you an unevenly cooked piece of meat. Parts may be over-cooked and dry, while other parts may be cooked just right. If you do plan to use your microwave to thaw a ham, follow the manufacturer’s recommendations on your model, and use the defrost settings. Ham should be cooked immediately after thawing in the microwave. Ham thawed in the microwave should not be refrozen. You should plan on 4-5 hours of thawing time for each pound of ham (and up to 7 hours per pound if you have a ham that’s larger than 10-11 pounds). A 10-pound ham will take 50-70 hours to thaw, or 2-3 days in the refrigerator or in a cooler. Should be fine! I usually plan on about 24 hours of thawing time for every 5 pounds.